Dolls House Miniature tables like the simple dollhouse kitchen table shown here are useful in many scale model scenes. The tables can be designed as workbenches for a shop in a railway scene, used as display tables for dolls house scale fairs or craft stalls, or built in different shapes and heights for cafe's, diners, and shops, or made the right size for end tables, bedside tables, or coffee tables. The instructions that follow show how to construct a simple rectangular table with legs securely held in place by a table apron that supports the table top. With a little practice you can move on to making tables where the legs are glued on the outside corners of the apron, potting tables with an apron expanded to make a back wall, or tables with extra detailing or more elaborate tops or legs. Wood: You are best to use an easy to cut wood such as Basswood or Jelutong. A list of sizes for various scales follows this list of materials. Smaller scale tables can be made with a heavy card as well as wood. Round, oval or square tables can often be made with pre-cut shapes available from the craft store. Miter Box: Simple craft miter boxes are fine. Razor Saw or Craft Saw: You will need one that fits in your miter box. Adjustable Clamps: to hold wood and miter box to your workbench or table. Ruler: To accurately measure your table pieces. Pencil: to mark your wood for cutting and gluing. Table Top: To make a miniature table you will need a table top, either purchased pre-cut from a craft store who sell squares, rectangles or ovals of thin wood or card. You can cut your own tops from wide strip wood. 1:6 scale table: you will need a piece of wood roughly 1/8 to 1/4 inches thick, in the length and width you want for your table. 1:12 scale table: You will need material between 1:16 and 1/8 inch thick. For the table shown I used a 4 1/2 inch by 2 1/2 inch strip of basswood 3/32 inch thick to make a kitchen table that represents a table 30 inches wide by 4 1/2 feet long. 1:24 scale table: to make the same kitchen table in 1:24 scale you would need a piece of wood 1 1/4 inches wide by 2 1/4 inches long, and 1:16 inch thick. 1:48 scale: to make a quarter scale table card is a better material than wood for the table top, with the thicker card used for the apron. The kitchen table in 1/4 scale would be 5/8 inch wide and 1 1/8 inches long. Table Apron: The apron supports the table top and helps to hold the legs square. To make an apron, you need wood which is the scale equivalent of four to six inches wide in your chosen scale. For the 1:12 scale table I used 1/4 inch wide by 1/16 inch thick strip wood. You can use wider wood for this scale if you prefer. You will need a length of stripwood (or card for tiny tables) equal to two times the length and width of your table top. Table Legs: Each table will require four legs which are slightly less than 30 inches long in scale. Standard table tops are 30 inches above the floor. For the 1/12 scale table, the legs are 3/16 to 1/4 inch square stock in lengths of 2 3/8 inches. You will need a ten-inch length to make the four legs. For a 1:6 scale table use 3/8 to 1/2 inch square stock in lengths of 4 3/4 inches so that you will need roughly 20 inches of stock and for a 1:24 scale table use 1/8 inch stock in lengths of 1 3/16 inches so that you will need six inches. For a 1/48 scale table, you can use matchsticks or 1/16 inch square stock which are just under 5/8 inches long. You will need two to three inches. To measure and cut the top for your miniature table, the first measure and cut your stripwood to length, then cut it to width. This makes the piece easier to manage as you cut it. When you are measuring, make sure your ruler is square to a square end of the wood. If the end of your wood is not square, sand the angle or cut the end square before you measure it to length. Saw on the outside of your measured line: If you want to keep your pieces the correct size, always measure the length you want, and line your saw blade up with the outer edge of the marked line, so you don't cut your pieces too short by the width of the 'kerf' or cut width of the saw blade. Clamp a Saw Guide To Your Work: To make sawing on a marked line easier, clamp your marked wood to your workbench with an adjustable clamp and clamp a scrap piece of straight edged wood or a metal ruler along the marked saw line so that the clamped guide is on the good side of the saw line. This guide will help you to guide your razor saw straight along your marked line. Cut your tabletop to length, and then trim the top to width, using the same technique of clamping the wood and a saw guide to your workbench. The sides and ends of a dolls house scale kitchen table apron are glued together and held square while the glue dries. Photo copyright 2010 Lesley Shepherd, Licensed to About.com Inc. The miniature table top is supported by a set of apron strips which are glued slightly back of the outer edge of the table underneath the table top. The easiest way to make a table is to glue the apron strips into a rectangle with the long edges overlapping the short edges at the ends; the apron is glued underneath the table, evenly spaced in from all the edges. Determine the Apron Strip Length: to work out the length of your apron strips, take your stripwood and lay it along one long edge of your table top on the underside of the table. Mark a light line on the underside of the table top along the inside edge of the strip. Repeat this on the other edges of the table. You should have drawn a rectangle which is evenly back from all edges of your tabletop. This rectangle will form your gluing line when you glue the apron to the underside of the table top. Mark and Cut the Apron Strips to Length: Now that you have the outline of your apron drawn on the underside of your table top, you can measure the long edges of your marked rectangle, and cut two side apron pieces to match this length. Use a miter box to make sure you cut the ends of the strip square, and use the first piece you cut as a guide to match the length of the second piece. Cut the two end strips of your apron so that they will fit between your side strips when you line the outside edge of the side strips up with the markings you made on your table (so that your apron will be glued between the lines on the underside of your table). Glue the Apron Together: Apply a small amount of glue to the ends of the shortest apron strips and glue the ends to the long strips so that the long strips cover the ends of the short strips. (see photo). Use square edged blocks or other items, or scraps of wood, to keep the apron assembly corners square while the glue dries. Try to place your scraps of wood, so there is some pressure on the corner glue joins to help the glue hold. If glue oozes from between the joins, wipe it off with a damp cloth, or scrape it away with a glue spreader, or scrap piece of plastic or card. Leave your table apron to dry. To finish the assembly of the miniature tabletop, use a glue spreader to spread a thin layer of glue along the narrow upper edge of the apron rectangle after the rectangle is thoroughly dry and glued solidly together. Line the glued edge of the rectangle up with the rectangle you drew on the underside of your table so that the rectangular apron is an even distance away from the table edge on all sides. Press the apron down onto the underside of the table and use a glue spreader or strip of waste plastic or card to remove any excess glue from the joint. If you have a plastic cutting board, lay that on top of the apron and weight it down with a book to help clamp the apron to the underside of the table top. To make sure the legs for your dolls house or model table are cut to the same length, use a straight edged scrap of wood as a cutting guide or jig. Clamp a scrap of wood to your workbench so that the length from the straight edge of the wood back to the center cutting opening of your miter box is the correct length for the legs of your table (see photo). Remember that you will be making your cutting line on the wrong side of your marked line. When your measurement looks correct, line up a piece of wood in your miter box so that it touches the end of your clamped jig and cut your first table leg. If you have the measurement correct, you should be able to cut the remaining three legs without adjusting your jig, and all your legs will be the same length, no wobbly tables! Check that your first leg is the correct length before you cut the other legs. To glue the legs securely into the corners of the apron on your dolls house table top, apply a small amount of glue to the corner join of the apron. You must then slide the leg down the inside corner of the apron so that glue sticks to the side of the leg where it touches the apron, and the excess is pushed down under the leg where it joins the underside of the table top. Clear any excess glue away with a glue spreader, a piece of scrap plastic or card. It is important to clear away excess glue before the glue dries as it will leave lines where the wood cannot be stained and may make it hard to sand edges. Finish gluing the rest of the legs into the apron under your table top. Make sure the legs are glued to the underside of the top as well as the inside corners of the apron. 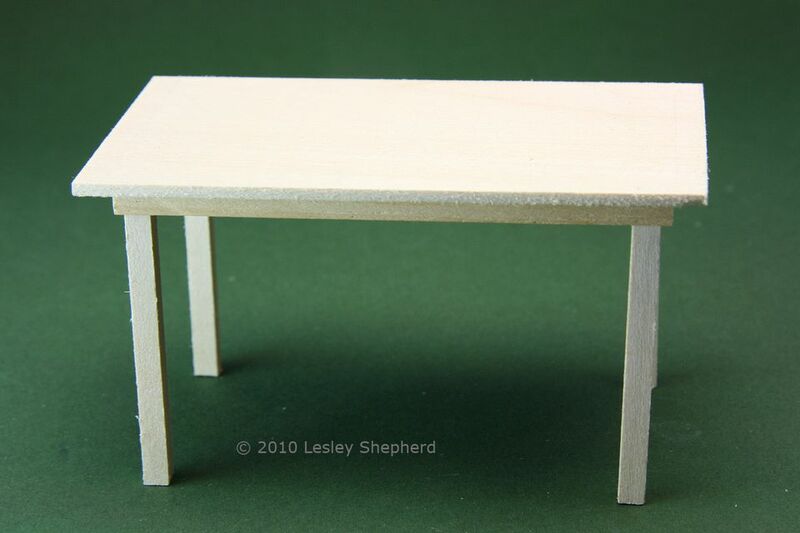 With the legs in place on your miniature table, gently turn the table over and stand it upright on a flat surface. Check that the legs are square and evenly spaced from each other at the top and bottom of the leg. Adjust them if they are not square with each other. When the legs are square, press the table top down onto the legs by placing a small book or another evenly weighted flat surface onto the top of the table, checking that the legs remain square. Leave the table to dry. When the glue is completely dry, and the table is secure, carefully sand any rough edges with fine sandpaper (at least 160 grit). Use a sanding block or wrap the sandpaper over a square edged scrap of wood to make a sanding block. This will help you to sand your edges square. If you want your table to appear worn, then gently sand the edges with sandpaper to round them softly. Finish your table with paint, stain, clear coat or a wax finish. To make a slightly higher quality miniature table, but one which needs very careful joins for success, glue the legs of the table with the apron sections between them, rather than on the outside of the legs. Assemble the legs and the apron as a rectangle: to make this slightly more sophisticated table, cut the side apron pieces shorter by the width of two leg widths. Cut the end apron pieces shorter by two leg widths as well. Line the edges of the apron up with the outside edges of the legs, gluing the side sections together first, and then gluing the side section together with the short apron sections. For a variation, you can glue the apron sections to the middle of the leg rather than the outside edge of the leg. Add a Decorative Line on the Apron: In this table from Country Comforts, the apron is wider than my simple version, and it has been given a small decorative line. You can do this by clamping a guide along the edge of your apron and making a simple saw cut. Do not cut through the wood! Just the wood surface deep enough to make a straight line! Look for similar variations on commercial and artisan miniature tables and try various assemblies to make more stylish tables from a wider range of materials. Tables can be made from plexiglass, acrylic, metal, and interesting hardwoods with a suitable grain pattern for scale miniatures. This potting table from CJ's miniatures follows the basic pattern of the simple table, but one side apron piece is extended to make a backsplash for the back of the table. Instead of this wide apron section being inset from the back edge of the table, it is glued to the back table edge and then glued to the remaining sections of the table apron. This is a fairly simple modification that extends the range of tables and counters you can make. Notice the planked table top. You can make planked, rather than solid or one piece table tops by edge gluing some wood strips together and letting the table top assembly dry before gluing it to the apron as you would a regular tabletop. This method also allows you to glue in banding strips of different woods, or thin lines of brass rod to make more interesting table tops. Add a shelf below the table top. Notice the shelf fitted between the legs of this potting bench. A shelf helps to keep narrow table legs square on taller tables, or tables which support a lot of weight.